It is raining soups... these days at home. One of the reason to have soups on menu is to reduce the amount of rice that we eat at night and ......the idea is working!!! with some extra work. As long as it is healthy and helps to shed some weight that extra work is joyful for me. 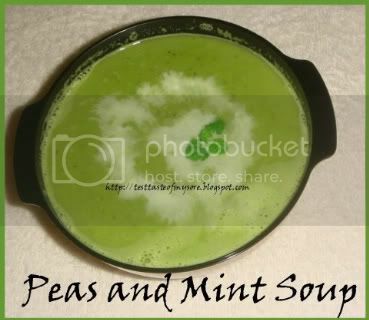 The taste of Peas and Mint Soup is very different from the soups that I have had till date. 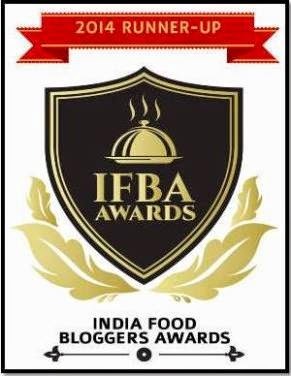 The subtle aroma of fennel seeds gave us a nice feeling when we had it on our dining table. Fennel's carminative properties helps to relieve flatulence (because.... of eating?/drinking peas in large quantity). Heat olive oil in pan. Add garlic and onion, sautee till onions are transcluscent. Add chopped mint, coriander and peas and give a nice stirr. Add water and stock cube. Cover and cook till peas are soft. Switch off the stove and let the bowl of liquids and solids cool down. Blend it in batches. Transfer the liquid to soup pot again. Add salt, pepper powder and warm the soup. never had this before sounds interesting..
looks delicious,..again somethine new for me ,..will sure try,..do post onion soup tooo..
bananeke ke baad batana kaisa laga..
ehehhee...even I heard it first time on Sanjeev Kapoor cookery show few months ago. But I did not note down the ingrediants. I had to google for recipes. Added and subtracted few ingrediants to make my own soup. Do try sometime, it tastes good. It is a dinner on its own no need to have anything after one big bowl of soup. Peas cause gas after eating in large qty..esp for me. I was thinking of adding jeera at first untill I saw some fennel seeds in my spice box, so just added some. We eat lots of rice. Soups have helped us to eat less. Color of the soup made me try :) and we loved it. It is low in fat, rich in fibre so nice and healthy too. do try it some time. nice colour ..soup looks delicious..lot of soups you are blogging these days!! !